Hockey is more than a game or even a way of life in Canada. Its a perfect window into the issues that confront the nation as it nears its 150th birthday with all its achievements and its challenges. Canada is a land of contradiction and curiosity that is best summed up in the national sport. 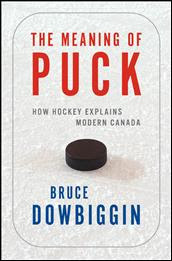 In The Meaning of Puck: How Hockey Explains Modern Canada, bestselling author Bruce Dowbiggin takes a tour of the country using hockey as his itinerary. In a series of essays, he shows how the national passion of hockey reflects the issues of globalization, regionalism, anti-Americanism and militarism in the new century. Using the dominant themes of the sport, The Meaning of Puck shows the challenges before the nation. More than just a sports book, The Meaning of Puck is a look into the fabric of a nation straining to keep old traditions alive and incorporate new national myths. 1) The Art of War: Why do Canadians simultaneously embrace the violence of hockey while also advocating one of the most non-military policies in the world? With many symbols gone and others endangered, Canada strives to guard its hold on hockey. How? It's the poison pill of fighting that keeps other cultures from stealing Canada's beloved game. 2) Uncle Same Wants You: How the Todd Bertuzzi incident showed that it's not the Americans who want violence in hockey. From Eddie Shore to Bobby Clarke to Bertuzzi, they were just following orders. Why Canada nurtures anti-Americanism in the sport. 3) The Devolution of Power: How the ongoing futility of the Toronto Maple Leafs mirrors the shift in power and influence to the West, particularly Alberta, As more Canadians chafe at the influence of Hockey Night in Toronto, the rest of the nation seeks a new locus of hockey influence. 4) Where We've Been And Where We're Going: Why Don Cherry remains a focal point in Canadian society by standing for the Code of Violence in a decidedly non-violent culture. It's because in a postmodern nation without rules or standards he still stands for something, however distasteful. 5) Creeps: Why hockey is a safe place for characters such as Alan Eagleson, Graham James, and David Frost to hide. And why it's so hard to get them out once they've attached themselves to power. More than just a sports book, The Meaning of Puck is a sobering look into the fabric of a nation straining to keep old traditions alive and incorporate new national myths. Folks, this promises to be an early contender for 2008 Hockey Book Of The Year. Dowbiggin is a critically acclaimed sports journalist whose many award-winning works include Money Players: The Amazing Rise & Fall of Bob Goodenow and the NHL Players Association, and The Stick: A history, a celebration, an elegy. His work in radio and television has twice won him the Gemini Award for excellence in sports broadcasting. He's as good as they get in the hockey literary world.